2019 Balikatan Eastern & Midwestern Regional Conference - Balikatan Ng Mga Kristiano, Inc.
We’re so excited to invite all of you: Intervarsity Christian Fellowship (of the Philippines, US, Canada) [IVCFP/USA/Canada] alumni, friends, ministry partners and 1st-time attendees, to the 2019 EMRC! Please browse through the slides for details. 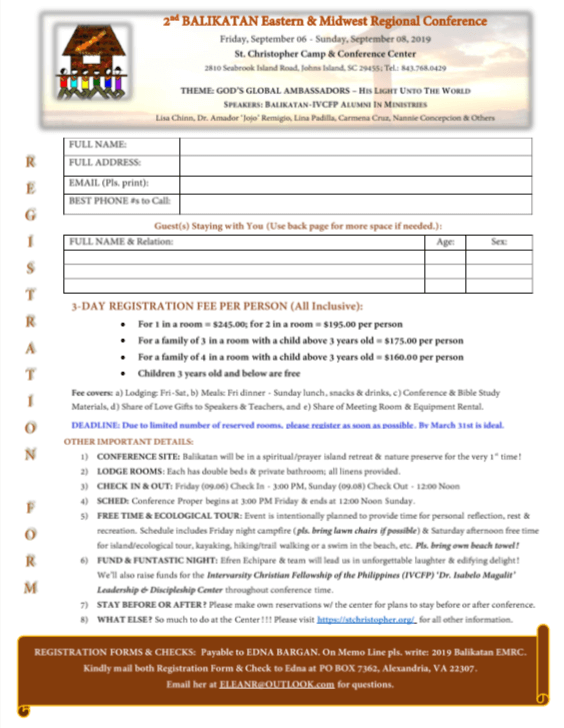 This will be a one-of-a-kind experience…by a gorgeous South Carolina beach…communing with God’s astounding creation. Meditating on His power through our global ambassadorship, we will celebrate His goodness to IVCF Philippines & Balikatan with both immense jubilation and quiet contemplation. Make it a family experience! Please share this invitation to everyone you know. 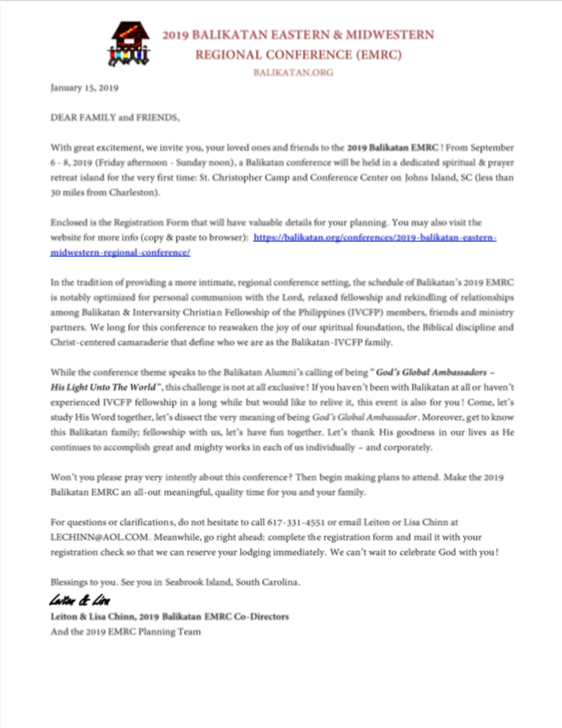 Read the Invitation letter to the 2019 Eastern & Midwestern conference. 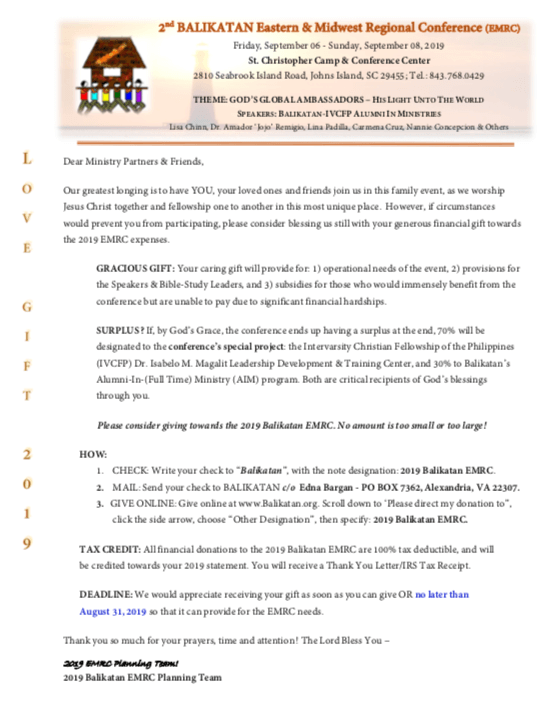 Please prayerfully consider giving to the ERMC 2019 conference. Click the speaker name to learn more about them. She served for 14 years as the National Director of International Student Ministry (ISM) of InterVarsity/USA (2000-2014) where she integrated her rich and varied experiences as a former international graduate student at Wheaton College in Illinois (MA in Communications), a campus staff worker with InterVarsity Christian Fellowship-Philippines and InterVarsity/USA, a certified cross-cultural trainer, Bible teacher, a pioneer of several ministries in the Philippines and the USA, an author, and speaker at various college events and conferences, including Urbana03 and Urbana06. Under her leadership, the ISM department grew in its outreach among internationals and attracted young and talented staff on her team. She also introduced new initiatives which include the International Students Track at the Urbana Student Missions Conference. She is a pioneer and thought leader in international student reentry and has authored various reentry publications and resources which include a new and expanded version of Think Home, a reentry guide for Christian international students, Back Home, a devotional guide for those who have lived and studied abroad, and Coming to America/Returning Home to Your Country. She also developed the only reentry simulation game, Customs and Culture. She has done numerous Cross-Cultural Transition seminars for international students and short-term missions in the US and overseas. In 2010, she was awarded the prestigious Hugh Jenkins Award for Excellence in Community Programming by NAFSA: Association of International Educators. Lisa was the co-founder of T.I.P.S.– Truro International Programs and Services, the 33– year old international outreach of Truro Anglican Church in Fairfax, Va. She also helped other churches begin their international student work in the greater DC area. Lisa is an unintentional church planter, having started a church from her neighborhood Bible study group. She and her husband, Leiton, are co-directors of the newly formed Anglican International Student Ministry Network seeking to mobilize Anglican churches in reaching international students in the US and Canada. Her leadership extended to serving on the boards of the ACMI, Balikatan, Inc., an organization of Inter-Varsity Philippines alumni in North America, and Hope International, a microfinance ministry granting loans to help the poor in 12 countries. Lisa is on the Advisory Board of the Global Diaspora Network of the Lausanne Movement. Having come from a big family (Lisa is 6th of 7 children), she learned the value of faith, hard work, sacrifice, community and relationships. She is mother to 3 married children. When not working or traveling for ministry, she can be found lost in the joy and wonder of her 5 wonderful grandchildren. She and her husband, Leiton, live in Indian Land, SC. 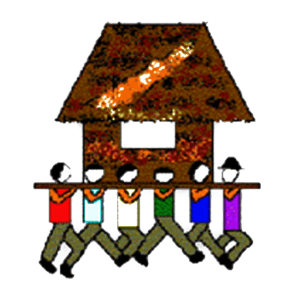 and are active members of their home association and of All Saints Anglican Church in Charlotte, NC. Currently, Lisa is serving part-time with InterVarsity/USA mentoring national leaders and young up-coming staff managers. In addition, she is also coaching leaders from 4 other organizations. She ministers as a cross-cultural trainer, conference speaker and global International Student Ministry and missions consultant. 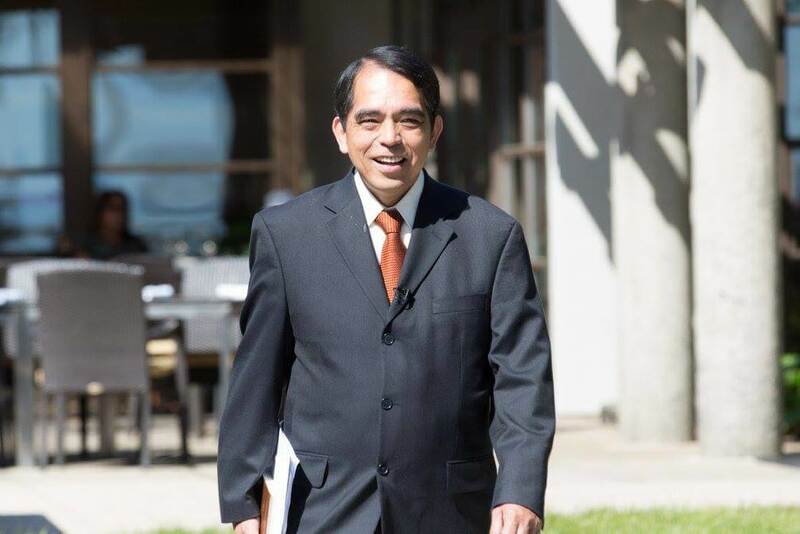 Dr. Jojo Remigio currently serves as the International Director of the Asian Theological Seminary’s (ATS) Center for Global Leadership Initiatives, and serves as an affiliate faculty member of ATS too. He has served also as an ordained pastor in the following churches with diaspora communities in the Lower Mainland of the Greater Vancouver Region: Immanuel Christian Reformed Church (Richmond), South Vancouver Community Church, New Life Alliance Church (North Vancouver) and the Peace Mennonite Church (Richmond). He has also been an elder in various evangelical churches in the Philippines, Thailand and Canada. Currently, he is SEND Canada’s international worker for the Filipino diaspora ministry in the Middle East. Previously, he has been involved in various missions trips to the Middle East as the Filipino International Network’s training consultant for Christian workers and pastors there who are ministering to the various ethnic diasporas. He has served too as the demographics consultant for the Global Diaspora Network and as a chapter contributor (Globalization, Urbanization, Diasporas and Pluralism in the21st Century: A Compelling Narrative for the Missio Dei?) to its book co-published with the Lausanne Movement entitled ‘Scattered and Gathered: A Global Compendium of Diaspora Missiology (2016). He was a former research fellow in Simon Fraser University and was a faculty member of Trinity Western University and the Fraser Valley University in Canada. In Asia, he was a professor at the School of Environment, Resources and Development of the Asian Institute of Technology in Thailand and was a former lecturer at the University of the Philippines. He also undertook various consulting assignments for various projects of the Asian Development Bank, the World Bank, United Nations and private corporations. Kalayaan (Nanie) Perez Concepcion is a retired public school special education teacher, and was an IVCF Philippines staff worker in the 70s. 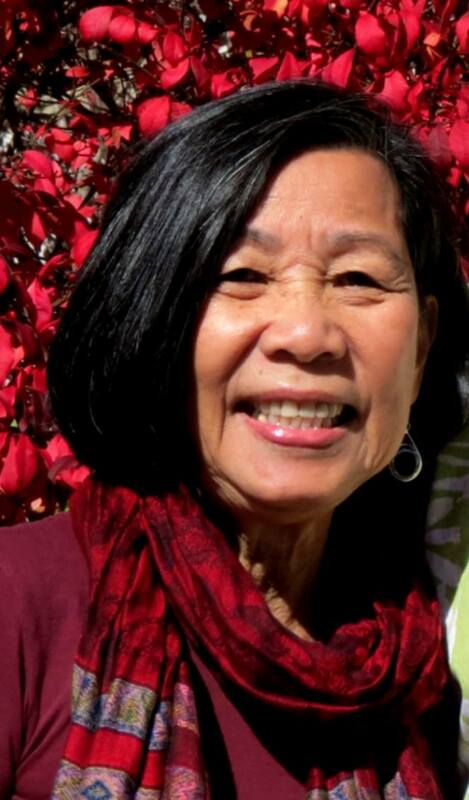 She and her husband Vic have been with Balikatan since its beginning in the 1980s. They have 5 grown children and 5 grandchildren. 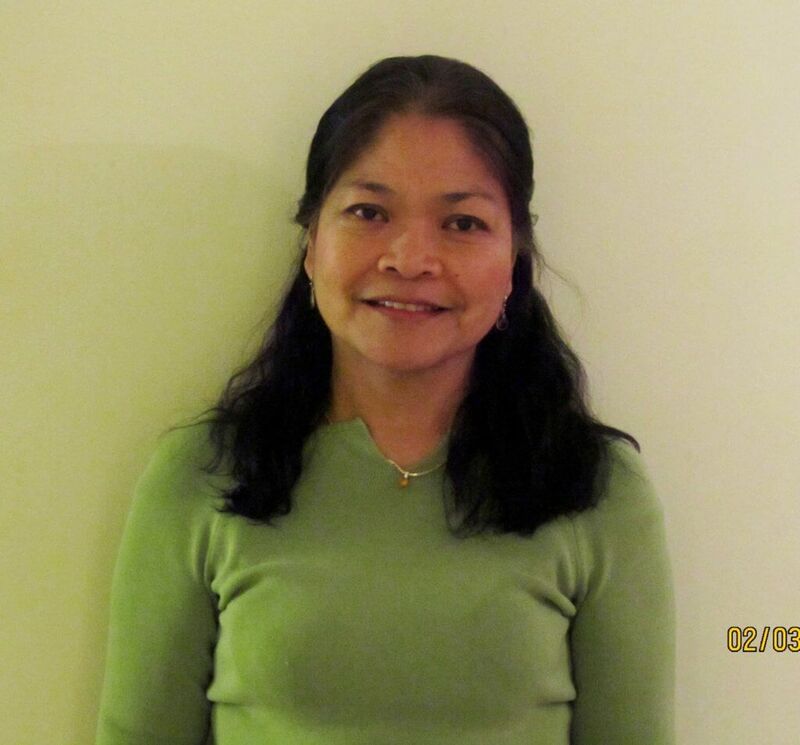 They are involved with Grace OPC church in Vienna, VA. Nanie has educational background in journalism, business management and early childhood special education. Vic is an engineer who recently retired from service in the federal government. Nanie’s passion is to see generations of believers young and old, who are seriously invested in Christ’s kingdom whatever their gifts and training are and wherever they are “planted”. The ‘gift’ of gathering at St. Christopher’s is not only the functional logistics of the lodge rooms, good eating, and meeting together in a convenient location, but also the setting that surrounds and immerses you in God’s natural sanctuary of His beautiful creation…reminding you to be good stewards of this special place. PLEASE REGISTER NOW! Lodge Rooms are limited. Contact Leiton Chinn at [email protected] for all information or questions or fill out the form below.